The present day digital cameras and camcorders come loaded with high end features so that all your special memories are saved in the form of good quality images and videos forever. With technological advancements, different camcorders are capable of recording videos in an array of video camera file formats and complete knowledge about the video file formats is important as it helps in editing and using the files. Additionally, in situations when you want to go for advanced editing or view camera videos on other devices, format compatibility with PC/Mac/other devices is required. A proper video software is also very important. Some of the commonly used formats by known camera brands include DV, HDV, MPEG-2, AVCHD, H.264, MPEG4, and others. Read below to know complete details about the digital camera video formats from the well known camera and camcorders brands. Part 3. Tips: How to Change Video Format to Be User-friendly Format? There is a long list of video file formats that are supported by different cameras and camcorders. Each of these formats has different file size, quality and behave differently when it comes to working with them on PCs and other tools. A roundup of the most popular camcorder file formats is given below. 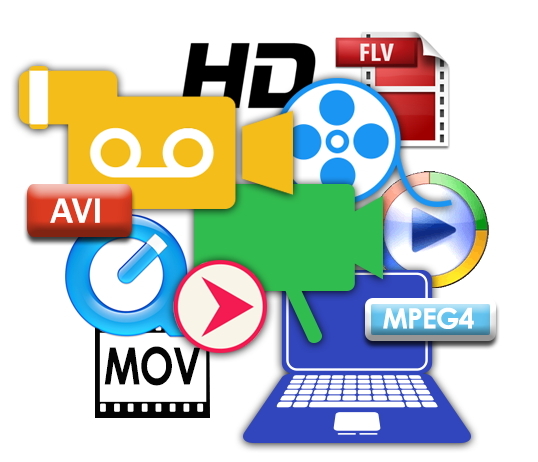 H.264 or MPEG-4 AVC (Advanced Video Coding, MPEG-4 Part 10) is one of the popular formats that is used not only by high end camcorders but also pocket size devices and camcorders. This is basically a very broad term of format that is capable of supporting HD and standard video recording. Mainly used for Web friendly products that can be sent over the net, H.264 or MPEG 4 format allows recording high quality video that can be compressed so that too much memory or space is not occupied. File Extensions: MP4, M4P, M4B, M4R, M4V, M4A, DIVX, EVO, F4V, FLV. Though camcorders with magnetic tapes are not in much use these days, DV file format was originally designed in order to store the digital video on magnetic tapes and HDV is the high definition version of the same format. HDV was originally developed by JVC and subsequently supported by Sony, Canon and Sharp, the HDV format was created so as to serve as an affordable high definition format for digital camcorders. DV and HDV file formats are known to produce high quality video outputs, but these files are memory intensive and occupy too much space. File Extensions: AVI, QT, MXF, MOV. AVCHD stands for the Advanced Video Codec High Definition format that was developed jointly by Panasonic and Sony and was introduced in the year 2006. The format can be considered as another variant of H.264 format and is capable of capturing high-quality videos. The format also allows burning HD video to standard DVD so that they can be played on Blu-ray player. The format allows recording videos at resolution range including 1080p, 1080i, and 720p. This is another popular format that is used by the majority of the standard definition camcorders. It is a high-quality format that is compatible with an array of computer media players and the format is also easy to be burned on a DVD. The majority of the DVD movies that are produced by Hollywood studios also come in MPEG-2 format. These files are large in size and thus cannot be easily uploaded on the Web or can't be sent through an email. Camcorders that record in this file format are generally expensive as they have high quality. File Extensions: EVO, MP4, MPEG, QT, MOV, VOB, IFO. There is a long list of popular camera manufacturing brands and each of them supports different digital video formats. For easy understanding of the brands and their supported formats, a comparison table is given below. When it comes to cameras and camcorders, Sony is reputed and a popular name. To capture images and record all your special memories in high-quality content, there are various cameras and camcorders launched by Sony. New models launched by the company come packed with all the latest features and technology. GoPro is a popular American technology company that is known for its high-end action cameras that can record a wide array of activities. The cameras manufactured by the company are waterproof devices and comes packed with advanced features like WiFi, wind noise reduction, voice control, video stabilization, auto upload to cloud, and others. There are multiple GoPro video format used by the devices. H.264 codec, AVI, MP4 file type. Canon is another popular camera brand that has been manufacturing cameras since 1984. This Japanese multinational company manufactures standard as well as high-end professional camera and camcorders. Panasonic is a Japanese multinational electronics corporation that has a decent range of cameras and camcorders to suit the needs of all types of users. The devices manufactured by the company comes with an array of features like MP in the range of 12 to 21, optical zoom in the range of 16 to 24, waterproof, and others. Nikon is a Japanese MNC that specializes in imaging products and optics. The camera and camcorders manufactured by the company are popular among professional as well as amateur photographers. Nikon cameras are available in a wide variety including entry level, mid range, underwater, movie camera, high end professional, and others. Though Samsung is not as popular as Canon and Nikon when it comes to the camera, the company has a decent range of devices including point and short cameras, interchangeable lens camera, Galaxy camera, Digital SLR cameras, and dual view dual LCD cameras. The camera by the company has all the features needed to capture good quality images and videos. 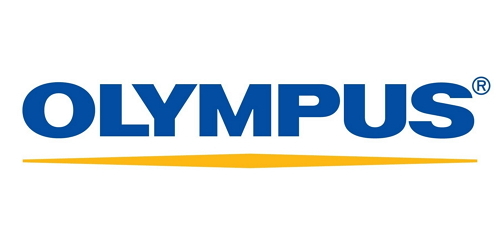 Olympus is a Japanese company that is known for manufacturing optics and reprography products. The first camera by the company, Semi-Olympus was launched in the year 1936 and since then it has been introducing latest products in the market. It was also the first company to introduce Microcassette. The range of interchangeable lens camera and compact digital cameras is launched by Olympus. 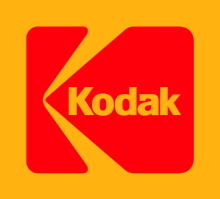 Kodak is an American technology company that has its historic roots in photography. Though the company is popular for photographic related film products, they manufacture cameras and camcorders as well. In the year 1975, the company developed a digital camera but then it was taken back in the fear that it would prove to be a threat to its business of photographic films. Presently they have a range of cameras including action cameras, Astro zoom digital cameras, smart lens camera, friendly zoom digital cameras, sports camera, and compact system S-1 cameras. We have seen in the above parts of the article that different camera brands support different video file formats which may or may not be compatible with your computer, software, and other devices. In case if you wish to transfer these videos to other devices or want to edit them, you need to first convert them to a user-friendly format. MP4 is one of the most commonly used formats that is compatible with working with almost all devices and programs. You can use software to convert videos to MP4 and other user-friendly formats. And one such professional software is Wondershare UniConverter (originally Wondershare Video Converter Ultimate). The software allows converting your files to an array of formats without any quality loss. 1 Connect camera to PC and add camcorder video. First of all, connect your video camera to your computer (PC or Mac). Download, install and then launch Wondershare UniConverter (originally Wondershare Video Converter Ultimate) on your computer. Here we make Windows PC and GoPro video with .avi format for example, other brand cameras and video formats can follow the same steps. Under the Convert > Converting tab, click the inverted triangle beside Add Files and select Add from Camcorder from the drop-down list. 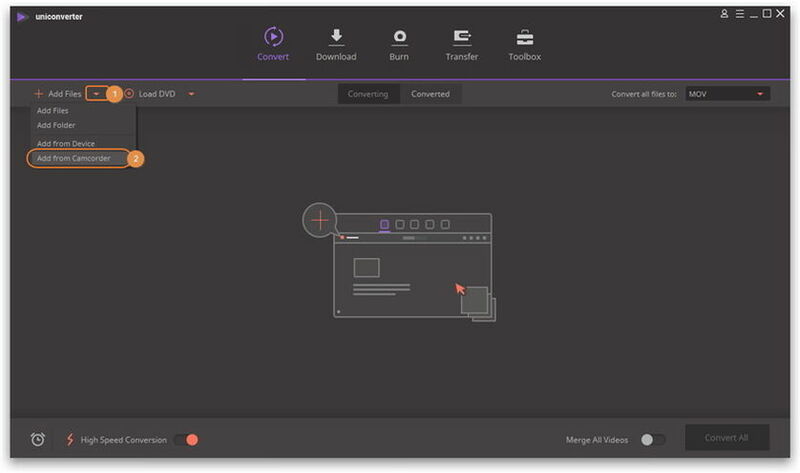 A pop-up window will come out and select the target video and tap Add to Convert List to load the video for the conversion process. Next, on the top-right corner, click drop down arrow beside Convert all files to: and select MP4 from Video category, and you can choose the detailed resolution. Step 3 Convert camcorder/camera video to MP4. Finally, click Convert button to start the conversion process. The added video file will be successfully converted to MP4 format and will be visible under the Converted list. 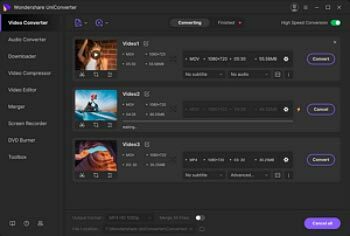 Thus if you are looking for a solution on how to changethe video format, then Wondershare UniConverter (originally Wondershare Video Converter Ultimate) will be an apt choice. So no matter whatever camera video formats you have, if you are looking for the ways on how to change the format of a video, the above part of the article will surely help you. Download it to have a free try now!